Deborah Zoe Laufer's "Sirens" opens with a couple, Sam and Rose, contemplating (or, more accurately, arguing about) how to celebrate their 25th wedding anniversary. When it comes to anniversaries, you need to represent both halves of the couple, after all. But songwriter Sam is in the middle of trying to recapture his youth and his youthful enthusiasm for songwriting, so he isn't in the mood to think about anniversaries, while Rose would really like something special to commemorate 25 years. As it happens, I first saw "Sirens" at Actors Theater of Louisville's Humana Festival of New American Plays in 2010, and just before I went, my husband and I were contemplating (or, more accurately, arguing about) how to celebrate our 30th wedding anniversary. I remember seeing that first scene and feeling a sense of recognition, a sense of "Oops. This play is talking about me." We certainly didn't do a cruise to the Greek Isles for our anniversary, and I think maybe watching the play informed my decision. But I loved the Humana Festival production of "Sirens" because of its underlying truths, its sense of humor, and its sense of whimsy. In fact, I came back and wrote a rave review for it, parts of which have shown up on the back of the published version of the play. I suggested "Sirens" as a play that might suit Heartland Theatre, it was chosen, and I am currently working on the props the actors carry in the play. (So if you go and see a pretty glass of wine or a tortured length of knitting, remember me.) As Ron Emmons, who is directing the play for Heartland, has said, it could be viewed as a play about marriage, about midlife crises, about writer's block, about one-hit wonders, about modern life and social networks and how they create even more challenges for the AARP crowd, about a clever twist on Greek mythology for the new millennium, or about any number of other things. But mostly, it's a play about journeys, about figuring out where and with whom you want to be for the journey of your life. I was at a "Sirens" rehearsal just last night, and this play is looking really good. Todd Wineburner, a Heartland favorite, and Connie de Veer, last seen there in "The Trip to Bountiful," have developed a sweet, real chemistry that makes Sam and Rose rootable (and since Sam has his less-than-sympathetic moments in the script, the fact that Wineburner makes you understand and root for him, anyway, is pretty impressive), while Gwen de Veer, who starred in "Proof" at Heartland last year, is lovely and magical as the various Sirens who sing a song only Sam can hear. This is the first time mother and daughter Connie and Gwen de Veer have done a show together, and that's pretty magical, too. The fourth member of the cast is a newcomer to Heartland, Andrew Rogalny Jr. He is a sophomore at ISU; you may have seen him as Antonio in ISU's recent "Merchant of Venice." His character, Richard Miller, adds a crucial component to the plot, as sort of a siren for Rose, and Rogalny is totally going for it. I know I've already used both these words too often in this piece, but Emmons is putting together something quite special and magical for the Heartland stage. As I said when I saw the play in Louisville, "The humor and warmth, as well as the understanding of what it means to be married a long time, are things that never go out of style." 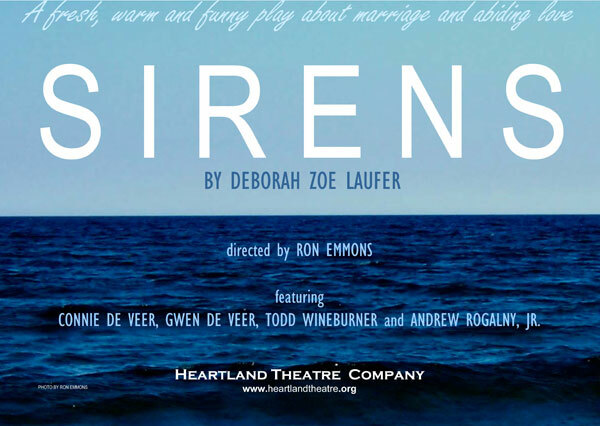 Performances of "Sirens" begin at Heartland next week, on November 3rd, with a Pay-What-You-Can preview. Regular performances commence the next night and continue through Sunday, November 20th. I would highly recommend you reserve a seat at "Sirens." Special... Magical... It's what theater is all about. For more information or a bigger look at the beautiful blue poster, click here. To jump right to reservations, click here.